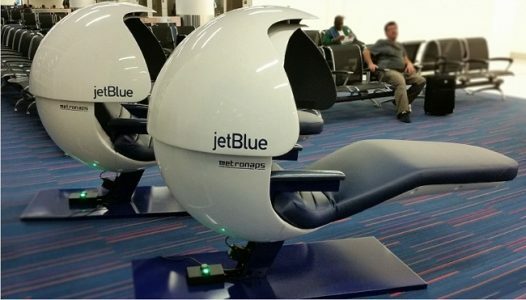 JetBlue is making it easier for weary travelers to take a quick nap before takeoff. The airline unveiled four JetNap EnergyPods in its terminal at JFK airport in New York City. The pods, which are created by New York-based MetroNaps and look like a futuristic reclining chair, play rhythms designed to help bring relaxation and reduce distractions. When nap time is over, the chair wakes the traveler up with a combination of lights, music and vibrations. Passengers will be able to snooze in the pods for free for 20 minutes. JetBlue said the goal is to give fliers the chance to recharge. To read more at CNN, click here.